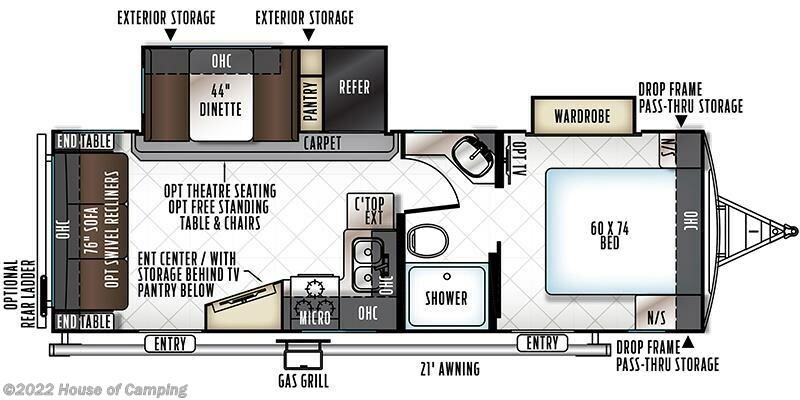 ALL NEW FLOOR PLAN FEATURES FRONT BED ROOM WITH REAR LIVING ROOM PRICE INCLUDES THE FOLLOWING EQUIPMENT. STANDARD PACKAGE F: ENCLOSED UNDERBELLY,FRAME MOUNTED JACKS, A&E POWER AWNING WITH LED LIGHT STRIP, TORFLEX RUBBER RIDE SUSPENSION, POLISHED ALUMINUM WHEELS, LED TV WITH MULTI DIRECTIONAL ANTENNA, MULTI ZONE STEREO WITH DVD/CD/AM/FM STEREO AND BLUE TOOTH CONTROL, SLAM LATCH BAGGAGE DOORS, WIFI RANGER WIFI BOOSTER, OUTSIDE SPEAKERS, 13,500 BTU DUCTED ROOF AIR, UNDER MOUNT KITCHEN SINK, SOLID SURFACE KITCHEN COUNTER TOPS, MICROWAVE OVEN, DOUBLE DOOR REFRIGERATOR, SERTA MATTRESS, GAS/ELECTRIC WATER HEATER, BLACK TANK FLUSH, SPARE TIRE CARRIER AND COVER, OUTSIDE GAS GRILL, BONDED WINDOWS, AUTOMOTIVE WINDSHIELD, SOLAR AND BACK UP CAMERA PREPPED. ADDITIONAL OPTIONS INCLUDED: CHAMPAGNE EXTERIOR, POWER TONGUE JACK, POWER STABILIZER JACKS, RAISED REFRIGERATOR DOOR PANELS, LED BEDROOM TV, SMALL AND LARGE TOPPER AWNINGS, DAY/NIGHT SHADES, REAR LADDER, WATER FILTER SYSTEM, CO DETECTOR, MAXXAIR VENTILATION FAN WITH COVER, FREIGHT, PREP AND DEMO FEES. See this Stock # R202028377 - 2020 Forest River Rockwood Ultra Lite 2612WS on House of Camping! Check out Stock # R202028377 - 2020 Forest River Rockwood Ultra Lite 2612WS on forestriverrvsource.com!